Friend: I have an SRS account. Me: Oh, what have you invested your SRS funds in? Friend: I have not made any investment yet. Me: Are you waiting for a good market opportunity before entering? Me: Don’t tell me you are planning to leave the money dormant in the SRS account. Me: You do know that you’ll be getting the usual deposits interest rates right? Me: Then why are you not planning to do anything with the funds? Friend: I’ve only have $1 in the account. I started it to try out the process. Assuming that you have started an SRS account and have contributed more than $1, your next decision will be what to invest the funds in. The good thing about SRS investment options are that there are plenty of them so you have a very wide range of choices. This not so good thing about SRS investment options are that there are plenty of them and it can be quite a challenge finding the right one for you. More importantly, as I have observed from working with clients, their preferences and needs change over time about how they want to manage their SRS investments so it may become necessary to adjust your investments as you move closer to the age 62 trigger point. With the exception of people like my friend(real story by the way) who started an SRS account with $1 to find out for himself that the scheme is indeed not a scam, most people will have started an SRS account with the intention to benefit from the twin benefits of tax deferral and retirement planning. And having enjoyed the benefit of income tax deferral from contributing, there is still the need to invest the money to enjoy the full benefits of SRS participation. One way to understand the need to do something with the SRS funds is to consider what will happen if you choose to do nothing with the SRS funds. Let’s assume that instead of going for a 2 weeks holiday trip to Japan, you have instead decided to defer the trip for 20 years and save the budget of $10,000 into an SRS account. If you just leave the funds in the account, you will earn an interest equivalent to normal deposit rate. Let’s assume this interest rate to be 0.5%. After 20 years, the balance in the SRS account will grow to $10,511. Fast forward to 20 years later and you look forward to finally taking out the SRS funds for your long awaited trip to Japan. You went to withdraw the SRS balance of $10,511 (assuming no tax) and visited a reputed travel agency to enquire about a 2 week trip to Japan half thinking that you can fly super economy instead of economy with the interest earned over the years. And herein lies the problem – you were quoted an amount of $13,439 for the same 2 week trip to Japan with the same itinerary. The reason – inflation. 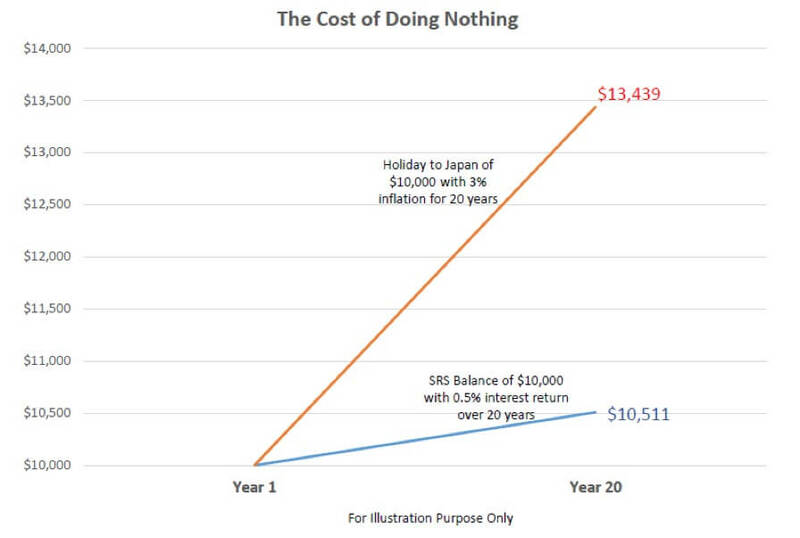 The cost of a holiday to Japan have risen at 3% a year (assumed) over the 20 years. Now, you are left to consider the option of flying budget or perhaps, going to a less enticing and much nearer destination. The benefit of tax deferral have been negated by the loss of purchasing power due to inflation and you wonder why did you contribute to SRS in the first place. In fact, participating in SRS may well have given you more grief than not participating if you did not make the effort to plan and invest. 1. Only single premium products are allowed (including recurrent single premium products, encompassing both annuity and non-annuity products). 2. Life cover (including total and permanent disability benefits) will be capped at 3 times the single premium. 3. Plans can allow for a contribution continuation feature/benefit upon disability. 5. Trust nominations are not allowed for life insurance products purchased using SRS funds. The investment possibilities for SRS meant that people who are at the “Do-It-Yourself” (DIY) end of the spectrum can use the funds to build and manage their own stocks portfolio while at the same time, people at the other end of the “Done-For-You” (DFY) spectrum are catered to with options to invest into managed funds and insurance products. Regardless of your personal preference to “DIY” or “DFY”, what will not change is the eventual use of SRS funds for the purpose of retirement. The SRS scheme can play a beyond-useful role if the planning is well thought out. Here is a 3 stage thought process that I use to help clients think about the types of investments they should be considering depending on the stages they are at. I have of course, very creatively names the 3 stages SRS – Start, Rebalance and Spend. Everyone has different starting points in entering the SRS scheme but generally, I believe most people will start contributing into SRS at around their 30s to 40s when the amount of income tax they are paying starts to get their attention. The will mean that counting back from the earliest penalty free withdrawal age of 62 under the SRS scheme, there is a good time frame of 10 to 20 years for most people to invest. As such, investments that have the potential to provide the most return over a 10 or 20 years period can be considered, moderated of course by your individual risk appetite. Stocks and shares (the good quality type) for the DIYs or a well-managed unit trust portfolio for the DFYs can be good options to consider during this stage. Tip: For the “DFYs”, you can even consider alternative investments or absolute returns strategies such as hedge funds during this stage. This is the time when more than usual care should be given to your SRS investments. At the earlier stage, you will still have time to make corrections if things did not work out the way you expect – bad market timing, underperformance of investment, wrong selection of investment…etc. At this stage, you are left with little or no time. You may have heard of the “drop and the bounce” in investing but if you haven’t, here is a quick recap. Suppose you started with an investment that is worth $1 and unfortunately, the market corrected and you lost 50%. The investment is now worth $0.50. The market subsequently recovered and went up by 50%. By percentage terms, your returns will have evened out (i.e. 50% drop followed by a 50% bounce). In actual terms, your investment is now worth only $0.75 (i.e. 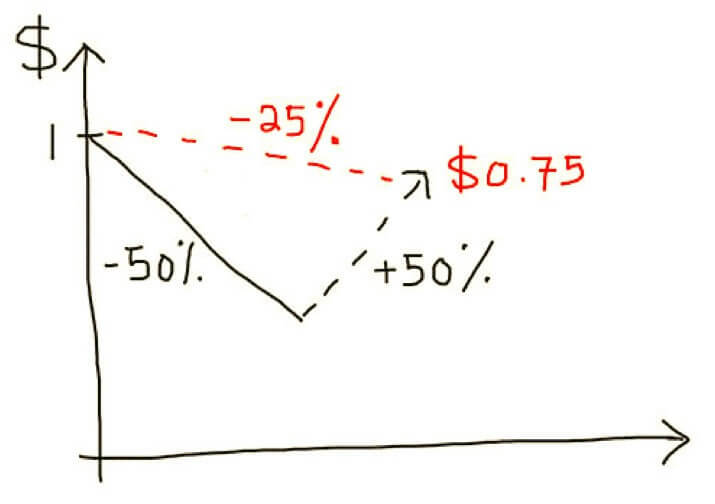 50% growth from $0.50). It’ll take a 100% bounce to make up for a 50% drop. If you suffer a 50% drop in the 2 or 3 years just before your retirement, the effect can totally wipe out all the tax benefits you obtained from SRS participation and some more. This important step of rebalancing is often missed out when SRS is not thought about as part of a retirement strategy with a deadline to start withdrawal. Tip: Do a 2 in 1. Rebalance not only the portfolio risk but also consider different asset classes such as insurance products and annuities that can provide guarantees and income for retirement and this brings me to the last stage. 3. Spend – From 62 onwards and probably about 10 years for most. This, ultimately, is what SRS contribution is all about. It should form part of your spending plan for retirement. Due to the tax rules around SRS withdrawal, there is still planning to be done over here to ensure that the returns are maximized. The spending (i.e. withdrawal) should be spaced out, over 10 years from the first withdrawal in order to fully benefit from the 50% tax concession. 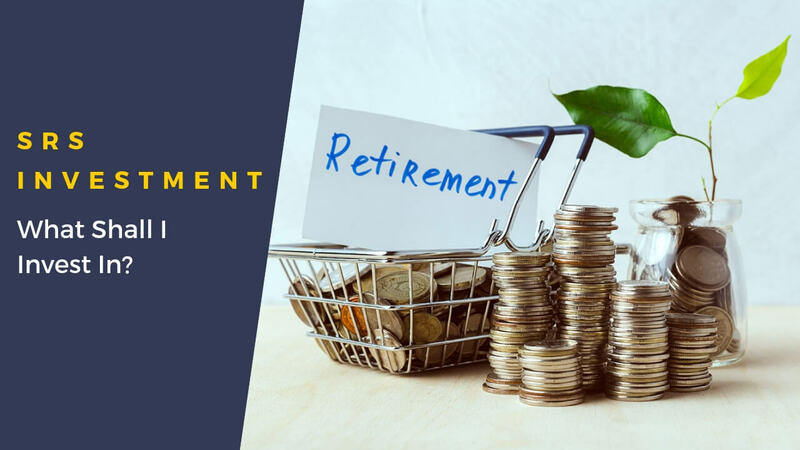 Depending on how you have set up your retirement income, the timing and the amount of withdrawal should be considered as it should complement your other income sources such as CPF-Life and other investment income. Tip : Consider annuity plans with a 10 year income payout to provide ease of management for this withdrawal stage. Using a snooker analogy, a good player aims to pot the ball not only with the intention of scoring it into the pocket, a good player makes the shot with an eye to position for the next play. Success in using the SRS scheme comes not just from participating in the scheme and saving some tax dollars today, success from participating in SRS comes when you are able to withdraw more funds than you have put in(after accounting for inflation, tax deferral benefits…etc) in retirement. In the initial stages, most people tend to prefer to manage their SRS investments by themselves and understandably so as they have the time and the energy to do it. Also, from choosing an investment point of view, people may feel that by DIY, they have more control and can manage better. At around the late 40s and early 50s, I do see quite a few who are looking for easier alternatives to manage their SRS investments. Perhaps, the time and energy that used to be ample in supply is no longer as before. Another possibility is the realization that the self-management of SRS investments will not stop at retirement but it will last well into retirement until the last dollar have been withdrawn from the SRS account. Suddenly, it is not so much fun. From the financial planning point of view, the real deal is about how you integrate SRS into your retirement plan and for most people at the pre-retirement stage, they have not have a proper written retirement plan done so they have no reference to point them on what to do and where to go. If it doesn’t sound fun, it is because managing SRS funds at the “Rebalance” and “Spend” stage is really not fun. If you are a DIY type of person, I hope that my ideas gleaned from helping people in their planning have given you something that can help you manage your SRS planning a little better. For the DFYs, here is an addition resource “for you”. 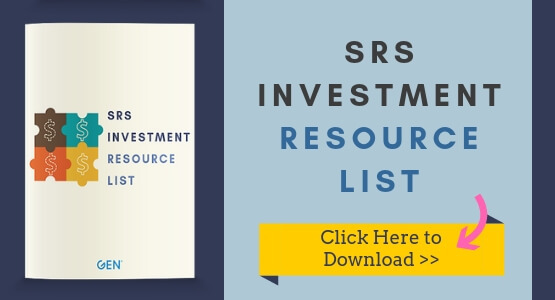 You can use this “SRS Investments Resource List” which provides some of the insurance and annuity plans to can help you transit from the “Rebalance” to “Spend” stages in a low risk and easy to manage manner. I’ve added in comments about what is unique about the plans in the resource which I believe will be helpful. Let me end by wishing you all the best in your SRS journey and that you are always cueing your balls right in the game of SRS snooker! If you want to know more about SRS Investment or any other enquiries, you may contact me through whatsapp, schedule an appointment with me or fill up the form below and I will get back to you as soon as possible.